Time is winding up for the December 15 deadline to file Form 990! 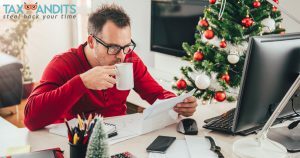 With Christmas right around the corner and various holiday festivities taking place, we realize how easy it is for tax related matters to be swept under the rug and forgotten about. That’s why TaxBandits has created a simplified e-filing process that you can complete with ease and maintain tax exempt status with the IRS. Before you have a panic attack, let’s make sure your organization is required to file a 990 Form by tomorrow’s deadline. Does My Organization Have to File by Tomorrow? Although exempt organizations must file with the IRS annually, all organizations are not required to file by tomorrow’s deadline. The general Form 990 deadline is the 15th day of the 5th month after your tax year ends. Organizations with a calendar tax year which ends in December would file on the standard May 15th deadline. The great thing about filing with TaxBandits, is that if you need more time to file your Form 990, you can simply file Form 8868 for an automatic 6-month extension! Form 8868 is used by nonprofit groups, charities, and other tax-exempt organizations to get an extension on their return. By simply filing this form with us by your original Form 990 deadline you will get an automatic 6-month extension of time to file your Form 990. Eliminate the worry and stress of missing your Form 990 filing deadline by easily filing with TaxBandits. Our comprehensive software provides a simple, interview style e-filing process that allows you to complete your form and instantly transmit directly to the IRS. We offer easy e-filing for Form 990 Series returns (Form 990, Form 990-N (e-Postcard), Form 990-EZ, and Form 990-PF) so you can quickly file the correct 990 Form for your organization. Getting started is easy! Simply follow the step-by-step guide to create your free account, enter basic information about your organization, complete the form interview, review your information and audit report, pay for your form, and transmit it directly to the IRS. The entire process is completed in 5 simple steps! If you need any assistance filing Form 990 please don’t hesitate to contact our amazing, US-based TaxBandits support team. We’re standing by to help! Give us a call Monday – Friday from 9 AM to 6 PM EST at 704.684.4751. You can also reach us via live chat and through our 24/7 email support at support@TaxBandits.com.